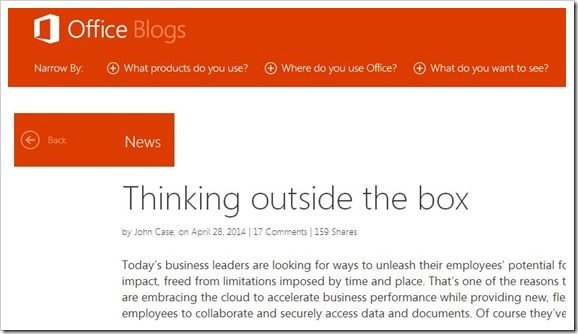 Yesterday, John Case, Corporate Vice President, Microsoft Office Division wrote a blog post on Office blog titled “Thinking outside the box” where he took a jab at other cloud storage providers. Without naming the competition, he mentioned that that businesses around the world should buy all-in-one product from Microsoft rather than buying technology “piecemeal” from multiple sellers (obviously hinting at Dropbox, box and others). 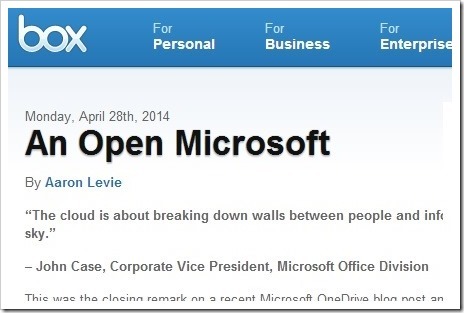 He went on to say, “The cloud is about breaking down walls between people and information. Not building a new set of islands in the sky.” What this essentially meant was don’t pickup cloud solutions from smaller providers who do not offer complete solution, rather come to Microsoft for a comprehensive one! This jab at the competitors was essentially part of their announcement, where they have now increased storage on their OneDrive cloud platform from 25GB to 1TB, a 40X increase at same cost. Apart from this, Microsoft also announced that all Office 365 ProPlus customers will get 1TB of OneDrive for Business storage per user as part of their Office 365 ProPlus subscription. Microsoft will also offer free services where they will help organizations migrate data from their existing solutions to OneDrive for Business. By keeping Office 365 users on the closed OneDrive “island,” Microsoft is stranding hundreds of millions of users and customers that have chosen Box, Dropbox, Google Drive, and others. And by releasing Office on the iPad without the ability to view or edit documents from any cloud service other than their own, they’re making it harder — not easier – for users to get the most out of their software. The post essentially pointed out that it’s not them who are creating islands, but Microsoft themselves are doing it. We have mentioned this earlier and saying it again now. It is refreshing to see how Microsoft is reinventing themselves since Satya Nadella has taken over the reigns of Microsoft. Microsoft has always known to be reactive, but since Satya’s arrival they have been proactive as well as aggressive. In larger scheme of things in the online world, we need a strong, aggressive and innovative Microsoft that brings about healthy competition amongst its peers. In this particular case, Microsoft needs to be more open (and in last few months, I see that happening) rather than harp about how others don’t offer all in one solution. In that sense, no one should ever go to Microsoft because Google’s offering are far more comprehensive and open as well! One thing is sure, we are going to have some exciting battles in the Cloud storage space space. Microsoft May Soon Set Up Cloud Data Center In India, Will Be First MNC To Do So! Canonical Shuts Down Its Ubuntu One Cloud Service- Result Of Competition? Google Slashes Cloud Pricing, Amazon Responds! So, Who Is Cheaper? I love DropBox and have used it for years both personally and in a business environment. The biggest challenge that they face is they provide a service that is easily replicated by any number of companies, including powerful ones like Google , Amazon and Microsoft. The services are a dime a dozen right now and they way I see it, there are two things that can set a company apart: 1) tight integration with multiple platforms and 2) lots of storage space. Dropbox is doing a great job on the integration front. But right now, they are getting pressure on the storage space issue. So right now I am making the switch to a product by Barracuda called Copy. They start you out with 20GB of space (more than I have on DropBox after years) and with referrals of 5GB a pop it can go up quickly from there. Check it out at https://copy.com?r=BlX7tm.